Since selling the GSX-R750 back to my buddy Doug, I've been on the hunt for something new. I think I'd finally figured out what I really wanted. The GSX-R750 had the power and handling but not the ergonomics for a good street bike that will see occasional track days. Well, not for someone who isn't in their twenties. I previously owned a Yamaha FZ1 so I knew I wanted something in the upright naked sport category. I set my sights on my dream bike of an Aprilia Tuono. 170hp V4 Euro sports bike is all kinds of amazing. However, it's pricey and maintenance isn't fun and while it's on the good side of Euro reliability, it still isn't great. I always had said if Yamaha would put their crossplane I4 engine from the R1 into an FZ1 it would be a successful motorcycle. Well, they finally did in the FZ10 and reviews prove that it works very well, but it's brand new and still too expensive. Not a lot of great deals out there to be had on them. Then I stumble upon the GSX-S1000. 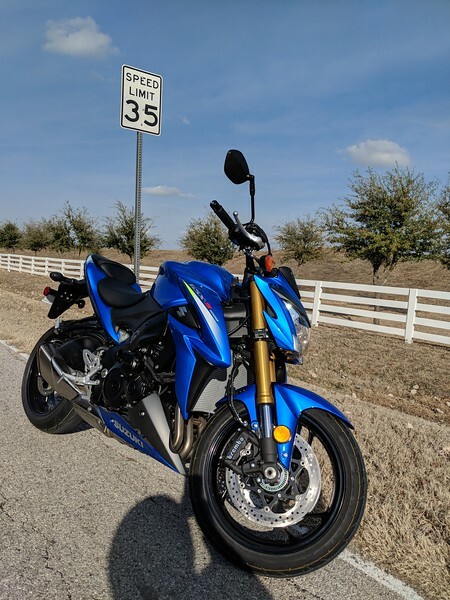 Suzuki took an older GSX-R1000 motor that was a stroker motor making more low and mid range torque, great for the street, and put it in a naked upright seated frame. Reviews are very positive on this bike with a few issues that are easily solvable. 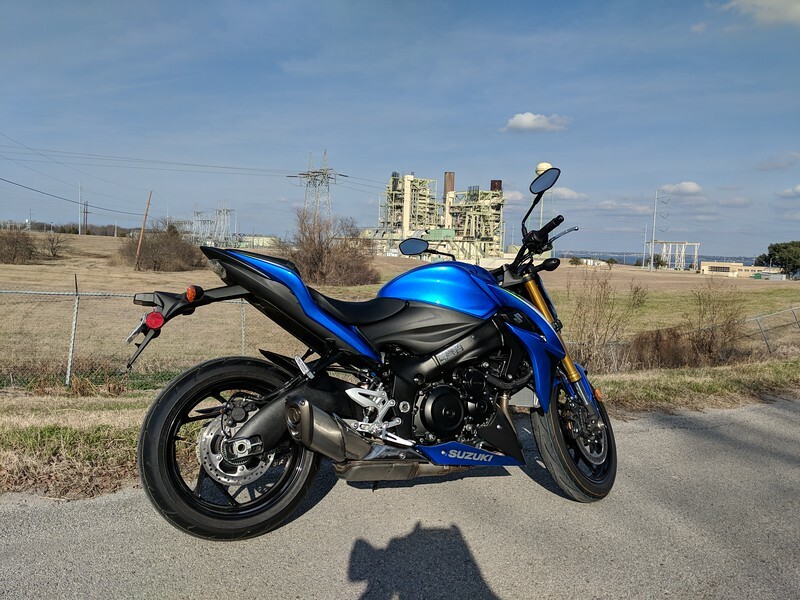 I did some fiddling to get Insurance in line, odd that I could insure a Tuono for about half the price of the Suzuki even though the Tuono is much more expensive. Switching companies and fiddling with coverage got me into an acceptable range. Then some searching and I found a local dealership that had a leftover 2016 model for about the best deal advertised in the country. Popping by on my lunch break I chatted with the salesman and walked out with a heck of an offer. Ran the numbers that night and the next day I made a commitment. Picked it up early Saturday morning. 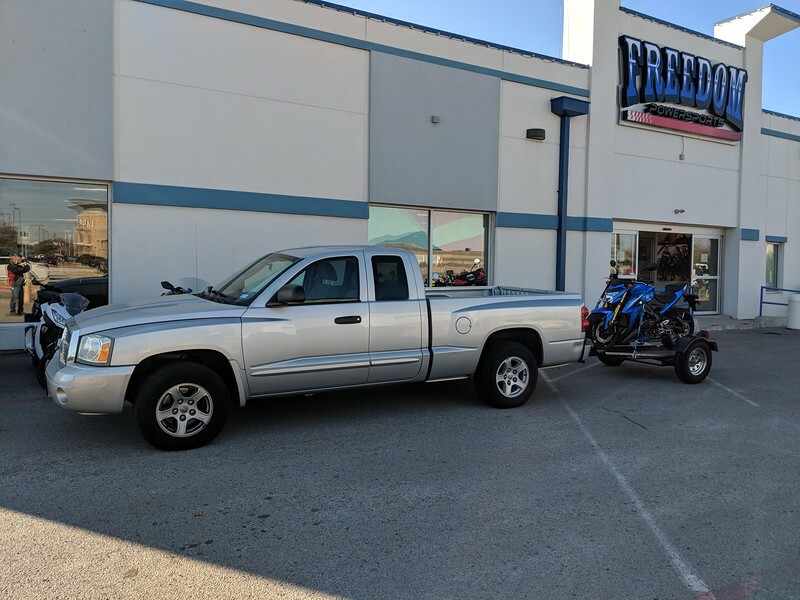 First time I've trailered a new bike home from the dealership, but I also haven't bought a new bike in seventeen years. Early morning, some potential hassle with paperwork (there wasn't any) and the cold weather allowed me to just go get it myself. Got it home and stashed it in my garage. I haven't owned a bike newer than 2007 so three way traction control is new to me as well as a few other things. I poured over the owners manual while eating lunch and then it was time for a ride. 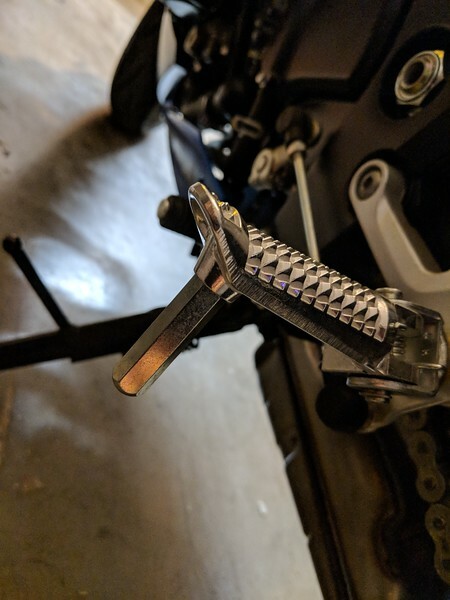 Making sure that the traction control for my new liter bike on new cold tires was set to Mode 3, effectively "Baby Mode" as opposed to full on racer mode, I set out. Oh what an amazing bike this is. Everything I read and watched was pretty spot on. The bike is absolutely bonkers, the motor is so strong everywhere. The seating position is perfect and the entire bike is very neutral. Brakes are strong and the steering is so responsive. I spent a while tooling around town getting to know the bike. This particular photo is a demonstration of something very difficult to achieve. Sunday I also got a quick ride in and took some photos of bits on the bike. I also spent some time tracking down and removing all the nanny stickers the factory finds necessary to put on the bike. Several are with the "Permanent" sticker material making them very hard to remove. I almost forgot to wear my helmet today but thank goodness Suzuki put a permanent sticker on my gas tank to remind me or I'd have forgotten to wear it. The octane rating sticker is helpful, but really, would have been nice to not use those insanely hard to get off stickers, cuz after a tank or two I'm sure I'll remember. That's the longest peg feeler I've ever seen! 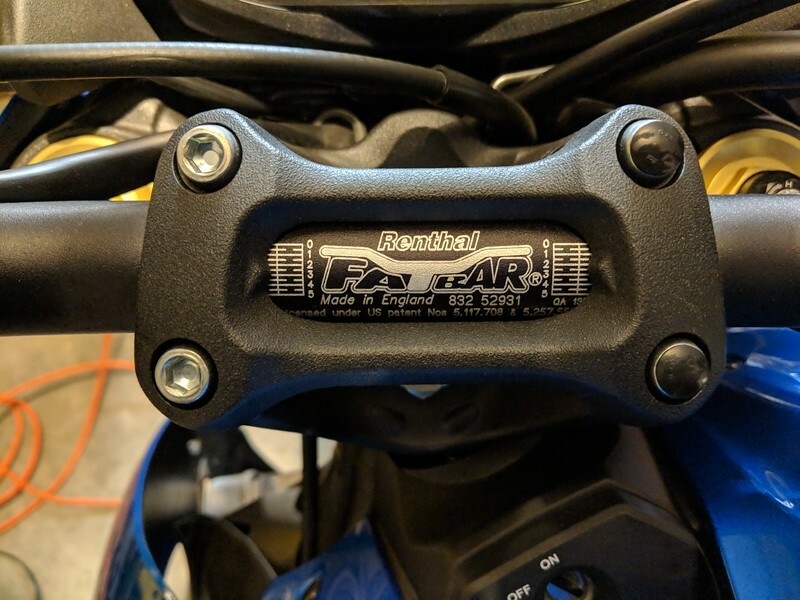 Love the Renthal Fat Bars on a sports bike. Makes the bike handle amazing. Brembo brake calipers! 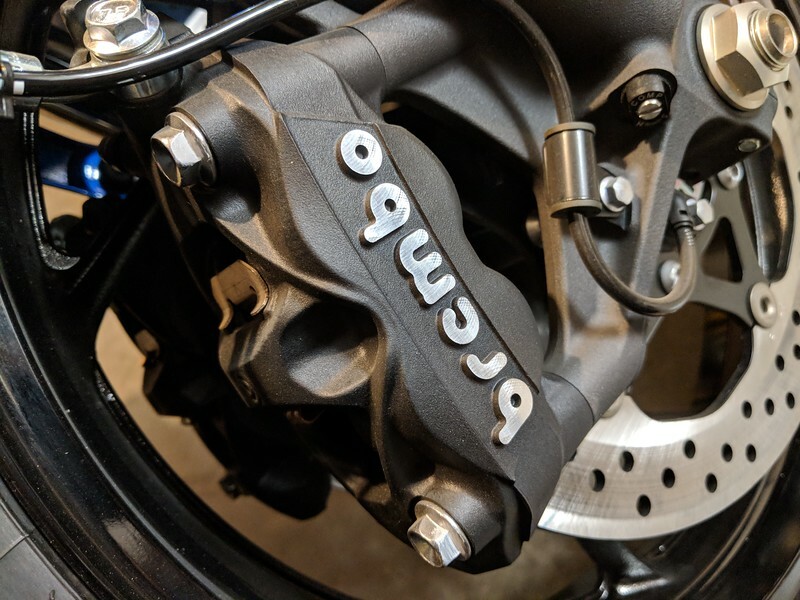 Now I just need to swap out the master cylinder for a Brembo one like I had on the old GSX-R750 and this bike will be a demon on the brakes. 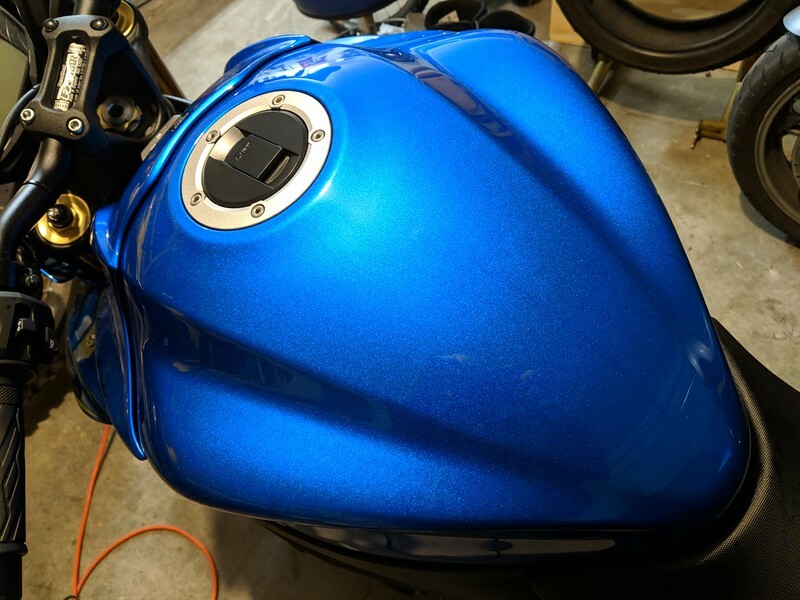 I've got some parts on order to clean up the insane rear end on the bike and I'm making my list of mods for it. It's pretty perfect but half the fun of owning a new bike is making it unique and getting it to fit you. Can't wait.